The new CORAL Magazine March/April 2010 digital edition is out with slew of informative articles. 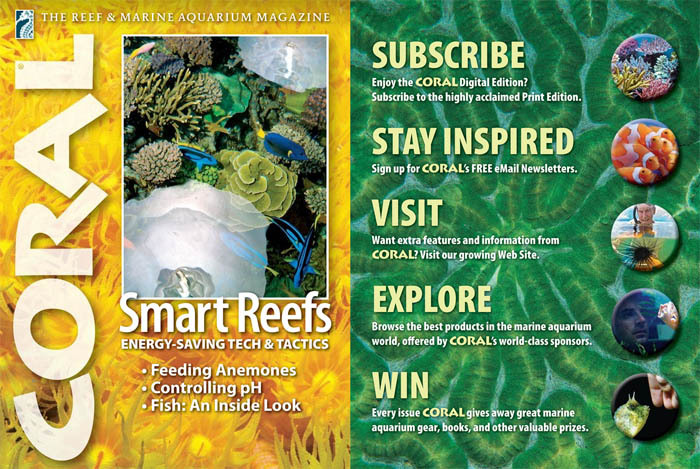 This CORAL Magazine edition is titled Smart Reefs and deals with energy-saving products and tactics. The articles cover the concept of green reef aquariums and provide some information about how to manage a thriving reef tank while using the least amount of energy. Selecting the best reflectors possible, in order to utilize every last bit of light products by your Metal Halides, T5 lamps, or LEDs is something that every hobbyist should consider. You may spend a little more upfront, but you’ll save both money and the environment at the end. Other interesting topics covered in this issue of CORAL Magazine are Feeding Anemones, Controlling pH, and an inside look at the most diverse vertebrate group on earth: fish. There are many other interesting articles included in the Coral Magazine March/April 2010 digital edition, so be sure to check it out.